This beautiful manufactured home, is a very luxurious and spacious floor-plan. It is 62 feet long by 32 feet wide That is 1880 square foot of spacious living space. This home features a formal living room as well as a spacious separate family room. Entertain your friends while the kids play in the family room. Plenty of room for everybody! 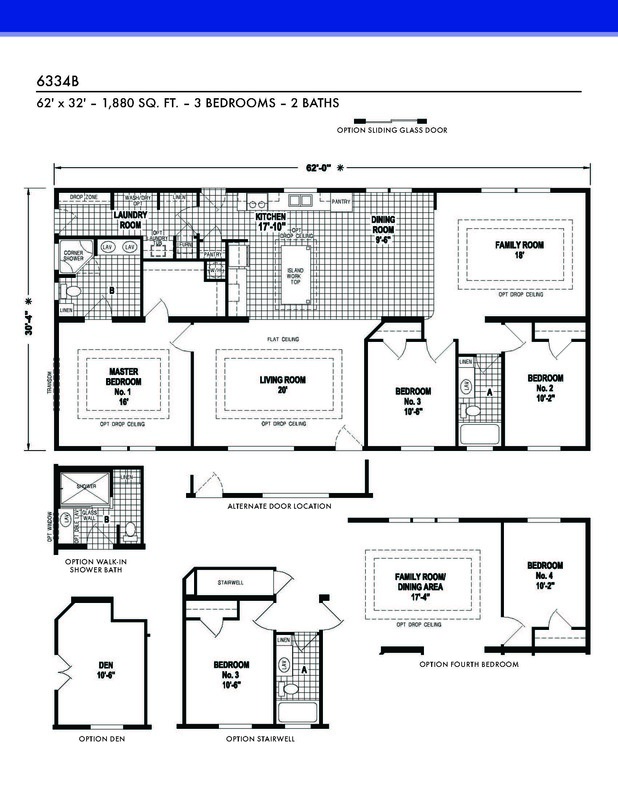 The Skyliner 6334B is one of our top three selling Floor-plans. The Skyliner series includes a wall mounted 30” flat screen TV for your master bedroom and a wall mounted 60” flat screen tv for your family room, (or lining room) you choose. A huge kitchen and dining area adjoins the family room. This is an excellent design for those who like to entertain. The kitchen features a huge pantry for storing you’re can goods and food staples. We have top of the line name brand appliances with a stove, refrigerator, dishwasher, and a built-in microwave. We have so many appliance options that it is impossible to list them all here so feel free to discuss this with your sales consultant. There are plenty of cabinets. We also install banks of drawers in the kitchen and baths. Most manufactured home retailers never mention banks of drawers and most customer never think of it until after they move in. The drawers have solid steel drawer guides to make them sturdier when you get them full. The flat island in the kitchen gives you much more counter top space to prepare on. The large master bedroom is accompanied by a huge master bathroom suite with a large corner fiberglass shower with glass doors. A beautiful continuation of the cabinets and subway tile from the kitchen flows into the bathroom with double sinks. The Skyliner 6334B features a built-in bench with storage above and below just inside the back door in the laundry room. This gives you a nice place to sit down, take your shoes off and hang your coat and cap up. The laundry room features plenty of space for you washer and dryer, shelving for storage, and a freezer space. Most of our customers like to have a deep laundry tub sink installed. We have been in business since 1958. We try to think of everything that would make your home practical for your lifestyle. We want you to enjoy your new home for years to come and we are happy to help you design the interior the way that you want it. There are so many great standard features built into this manufactured home, we would love for you to stop by Lovejoy Manufactured and Modular Home Sales and have one of our professional and knowledgeable sales consultants assist you with selecting your new manufactured home.